Books are wonderful things. I love them. I want to make them. I'm still writing stories and books and pestering agents about representation. So far no bites, but I've no intention of stopping. Books have been around for hundreds and hundreds of years, and despite technology, books are still going strong. Probably because not enough people have Kindles. And so, I offer you a list of gift suggestions for the book lover - besides from books themselves. These beautiful brooches are shaped according to the novel used to detail it, by House of Ismay. I adore them. The Of Mice AndMen dormouse especially. So cute! They're made from wood and detailed with an excerpt from the corresponding book, and measure 5cm. I have a lovely bag that was sent to me by Etsy for being a Team Captain, and I keep all of my brooches on there. I can't say I've bought any of them, I've either won them, been given them, or made them, but these brooches - many of them - would be wonderful to add to it. Especially because, out of all of my canvas bags, that one is the biggest and thickest, so it actually gets used rather than just hung up. Bookmarks. I hate - hate - it when people fold the corner down on books. It just destroys the book! I never lend out my books - not because I don't trust people, but because no one is interested - so it isn't something I have to worry about, but at the same time I feel sorry for that poor thing. Therefore, a bookmark is a perfect gift for a book lover - and bookmarks are common on Etsy. 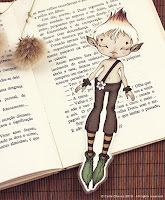 I'm sure most of you have seen the work by My Bookmark with the lovely leg/feet bookmarks. They're great, aren't they? Well, that's enough about them. That is the only mention they're getting here because they have all the attention they need anyway. Instead, let's have a gander here at these adorable illustrations! Sure they're not necessarily book-based, but they don't have to be! The Lynx is especially adorable. I'm not fond of Kindles. I mean, I was to begin with, and I actually toyed with getting one once, but when I had a quick look on Amazon and saw that it's only best selling books that are 90p on the Kindle, and that the books I would buy, and still intend to, are either not available on the Kindle, or cost just as much as a paperback. Sure, if I got them on the Kindle I'd save some paper and bookcase space, but at the same time, I also realised that if I dropped my Kindle, then that's my whole library gone. And then I found out that the cheaper ones break very easily - put them through the scanning machine in an airport and they'll break - and then I saw some advert that had a Kindle playing videos, it was the nail in its coffin. However, if you happen to know someone with a better quality Kindle, and who reads more frequently than I do, then a Kindle case might be a wonderful gift. Books look great, smell great, and feel very exciting. For me, at least. I don't get that impression from a Kindle. So, why not make it at least look like one. 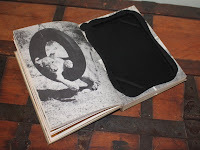 Yes, a hollowed out book; complete with the smell of paper, and the weight of an ordinary book, these beauties will also disguise your Kindle from any would-be snatcher, and would probably also protect it a lot better than a padded fabric case. Afterall, (yes, I'm going this far) a needle can pierce through a fabric case and scratch the screen. A book-box would keep the screen and its contents from being damaged at all. If I would ever get a Kindle, I would get one of these to go with it. Book Ends. I have a pretty standard bookcase. You know: top, bottom, shelves, back, sides. It's a shelved cupboard without a door, if that makes it easier for you, which means that bookends are redundant. Sure, I could get rid of the old thing, get some shelves put up...and...well now that's on my to-do list. I have too many books for that thing anyway. 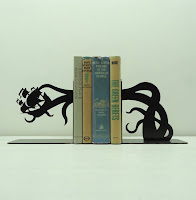 But nevermind that, book ends are awesome. Be they cut from metal or from wood, they're pretty cool. They have to be heavy, of course, or they won't do their job, but if they work right, they can be great. And who better to create such wonderful pieces than Etsy sellers? Whatever your passion - be it a book genre or a design style - you're bound to find something that is perfect. It would be a dragon for me, of course. These scarves are amazing. I was planning on getting one myself, but I'd rather like an excerpt from the Lord of the Rings on it. Either way, they're perfect for the standard book-lover. Curling up on the sofa with a blanket in the winter, cup of hot chocolate by the fire - you know, the typical scene - with this lovely scarf wrapped around your neck - you'd be snug as a bug. 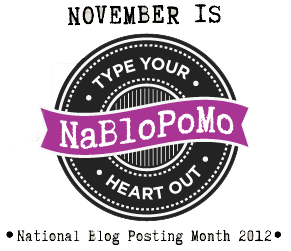 Plus it's an easy way to let the world know that you know how to read as well as standing out from the pack. 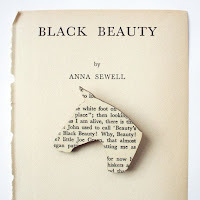 Much like the brooches above, there is a wide range of jewellery made of or inspired by books. Some are tiny little books themselves, others are made from pages, and others are of items or characters from the books themselves. 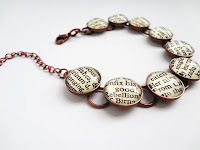 I have a ring in my shop made from pages of Treasure Island (use the code BookLover to get 20% off of it until Christmas!). But, self advertisement aside, there really are a wide range of jewellery pieces that would suit a book lover perfectly - earrings, necklaces, rings, you name it! Maybe even a plug or a lip ring if you look hard enough. OMG!!! 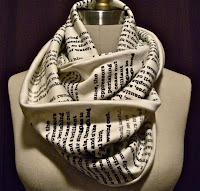 I love that scarf, and the bookends!! !